Great opportunity to get in to a well-designed café/coffee house/deli in the heart of San Diego's Mission Valley area. Seller has set this restaurant up right and in the right area. They are in a very busy retail center, surrounded by super densely populated residential, retail and commercial, your customers have easy access to the place. Walking distance from a huge and high end apartment compound, seemingly endless condos and townhomes and even QUALCOMM stadium. The restaurant is rocking on weekends and steady all week. Gross sales are averaging close to 20k per month and that is with only being open for breakfast and lunch hours. Easy to expand the hours to satisfy the pent up demand for dinner and see your sales boom! Location has outstanding online reviews and a very good internet presence, website design was high dollar and will convey with the sale. If you are a dedicated owner operator this is the place for you, huge opportunity to bring this place to the next lever and really see big numbers at the bottom line. 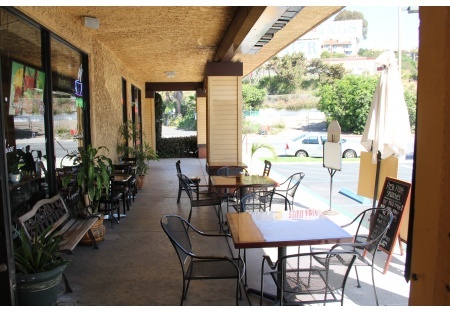 Restaurant space is approximately 1394 square feet with a nice covered patio for true café style dining. Base rent is $2107/month plus $800/month for CAM. Total rent is $2907/month and includes water and trash. Current lease term expires November 2018 with two (five) year options. The space is yours for a long time to come. Please go to SellingRestaurants.com to get the name and address along with photos of this restaurant.